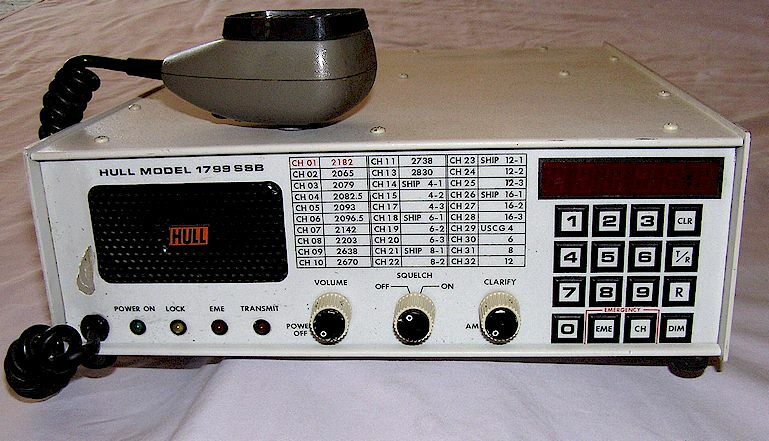 The Hull Electronics 924 is a synthesized marine HF SSB transceiver which operates as a USB radio, running about 150 Watts PEP output. It's not a mystery radio, but Hull has been out of business for some time and the documentation seems to be very hard to find. There is an antenna tuner built into the rear section. 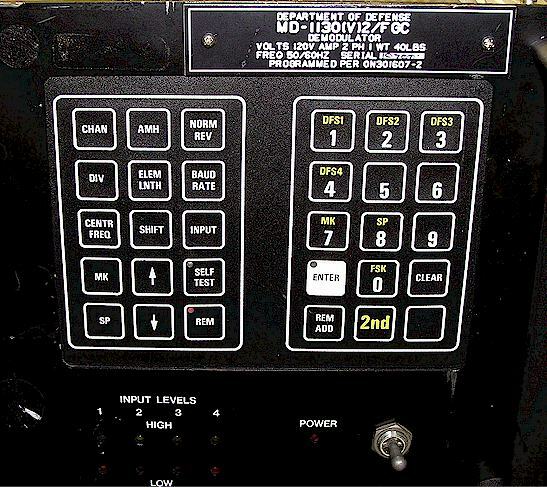 There is another version of the 924 which has a keypad on the front panel. This one has it hidden on the inside along with an LED display. It's odd that the model number wouldn't have been changed for such a major difference. 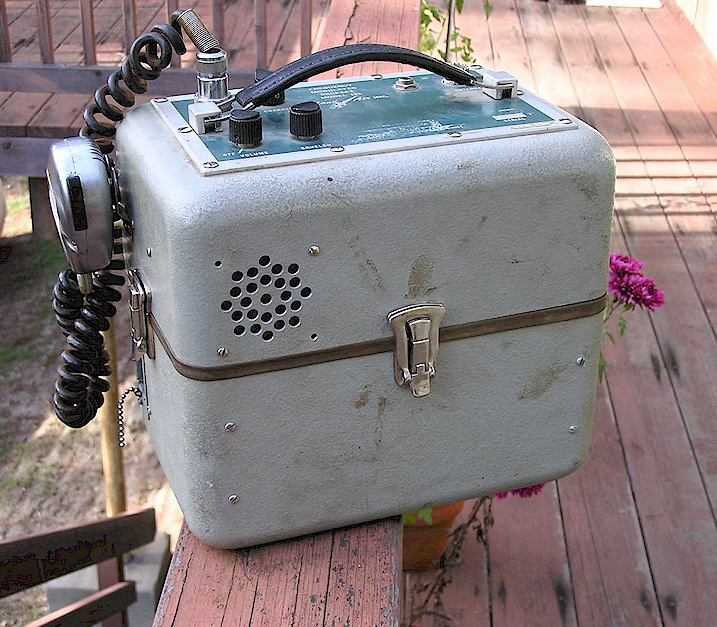 I am looking for the service manual for this radio in order to get it on the 60 Meter amateur band. Let me know if you need the manual as well, I will be happy to share when I find one. Courtesy of Jeff Pinsky, WA2SCL, I was able to obtain the rather arcane programming instructions for this radio and have retyped them as a pdf download HERE . 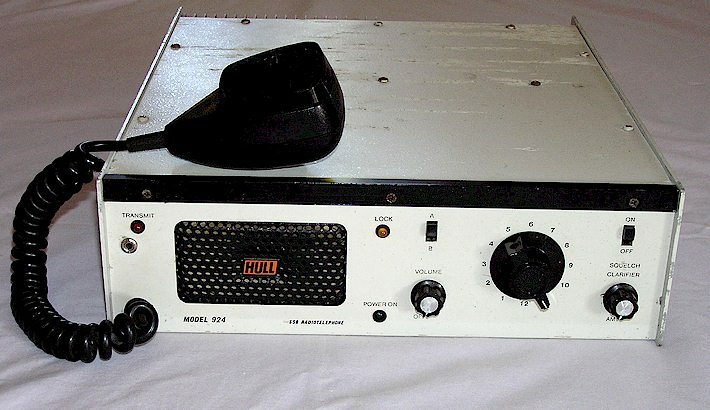 Not a mystery either, but another Hull radio with no documentation. Need the manual on this, and if you need one too, let me know and I'll help when and if I can! 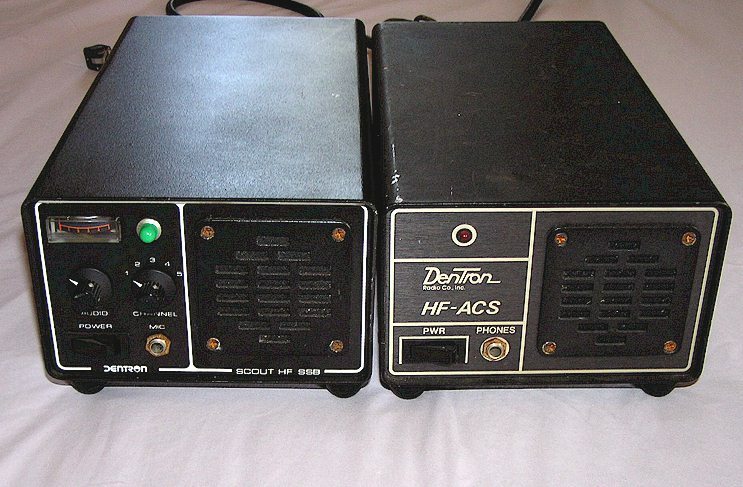 A candidate for "most obscure HF radio of the 1970's" is the Dentron Scout, a five channel utility radio which apparently covers approximately 2-10 MHz, upper sideband only. 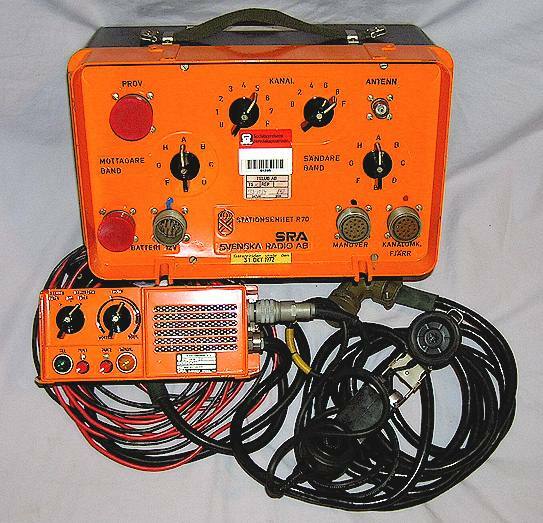 This was one of Dentron's last products before the company went out of business. 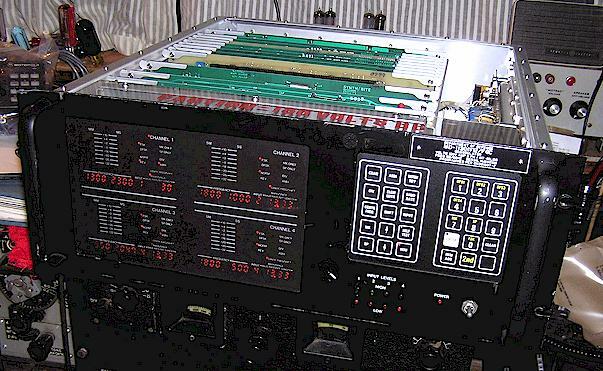 The main chassis of this set turns out to be the Mizuho SG-9 9 MHz IF-exciter system, coupled to a Dentron crystal controlled oscillator-front end board and a Dentron high power RF amplifier. Other than knowing that the main circuitry is Mizuho (apparently equally hard to source data for,) I have no data. I can tell you which pot adjusts the s-meter, but that's about it. Most or all of these sets seem to have been employed on Civil Air Patrol channels in the 4 MHz range. Mine puts out approximately 125 Watts PEP. 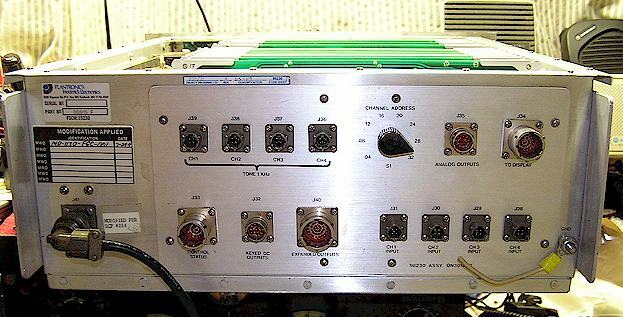 Dentron also used the Mizuho board in a QRP single-band transceiver they had in beta testing when the firm folded. The remains of that inventory have been sold and rebuilt into usable transceivers by enterprising amateurs in England and the USA. The Scout would seem an ideal candidate for the 60 Meter amateur channel group, but...what happened to the RIT / Clarifier control? A very necessary item, strangely overlooked in this set, not to mention that a squelch control would have been nice as well. Let me know if you have one of these also. By the way, the mike is a simple 500 Ohm dynamic CB style item, with the ground going to the barrel, microphone hi to the sleeve and PTT to the tip of a 1/4 inch stereo plug. One of the junkbox mikes I tried had a 1K resistor in series with the microphone element, but I left it in place and the mike sounds fine. 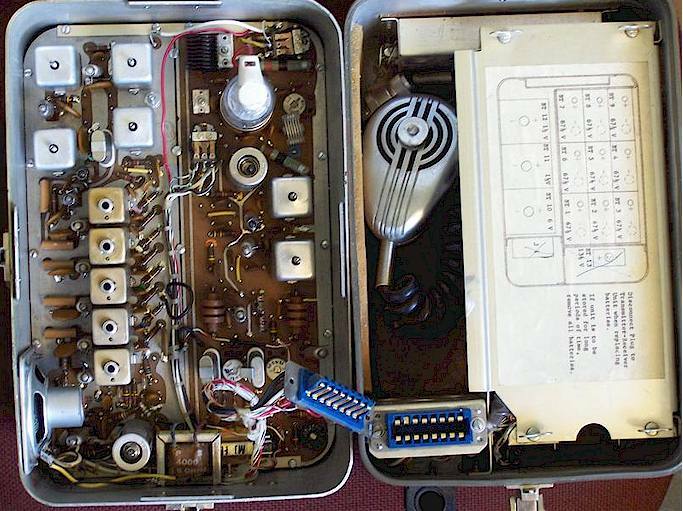 The photo below shows the Scout with the accessory HF-ACS regulated power supply, which, curiously, includes a speaker identical to that already inside the Scout. Perhaps the power supply was also sold for use with another model which did not feature an internal speaker. 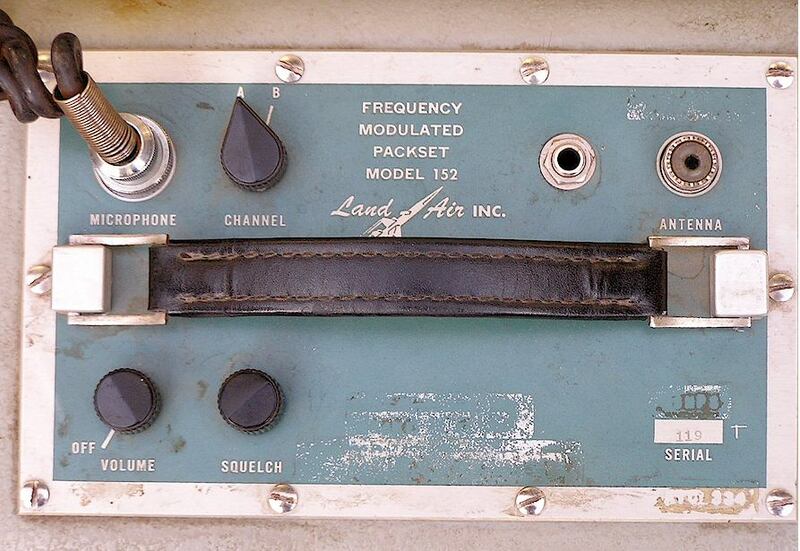 This is a VHF FM 40 MHz pack set radio made by Land-Air Corporation in the 1950's. It uses wire lead subminiature tubes and a pile of dry "B" and "A" batteries. Land-Air seems to have been a contractor for the United States Air Force which maintained military planes on US military bases around the world. Why they would go to the trouble of building their own radios, escapes me. It's much larger than contemporary pack sets by Motorola or Industrial Radio. Do you know anything about this radio? Frederick Electronics was a long-time maker of specialized RTTY equipment for the government. During the time this item was manufactured, they were part of Plantronics, Inc. This particular item appears to be four each of a version of the Plantronics Frederick 1280 RTTY terminal, built into a large cabinet. It uses a red plasma display as does the 1280. The ITT Cannon bayonet connectors on the rear panel are best described as "gruesome" regarding sourcing mates for each of them. It was part of a much larger system and showed up as surplus in San Diego, California, via the DRMO - Government Liquidation system. Based on the nametag style, these were made in a rather small quantity. Looking for any documentation or identification of this item! 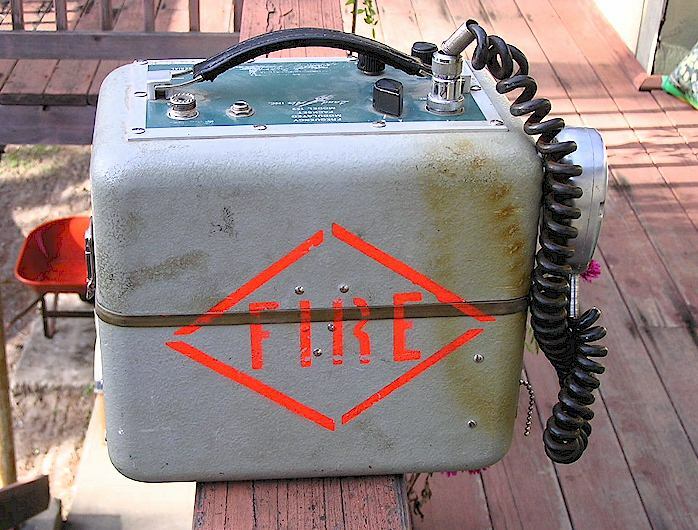 Update 6/25/2010 - - Thanks to Harold, WL7AWC, I now know that these were used by the Air Force in the early to mid-1980's as a replacement for the vacuum tube AN/FRA-86 equipment, which was a demodulator with a cathode-ray tube scope display. It would still be nice to find any of the manuals! 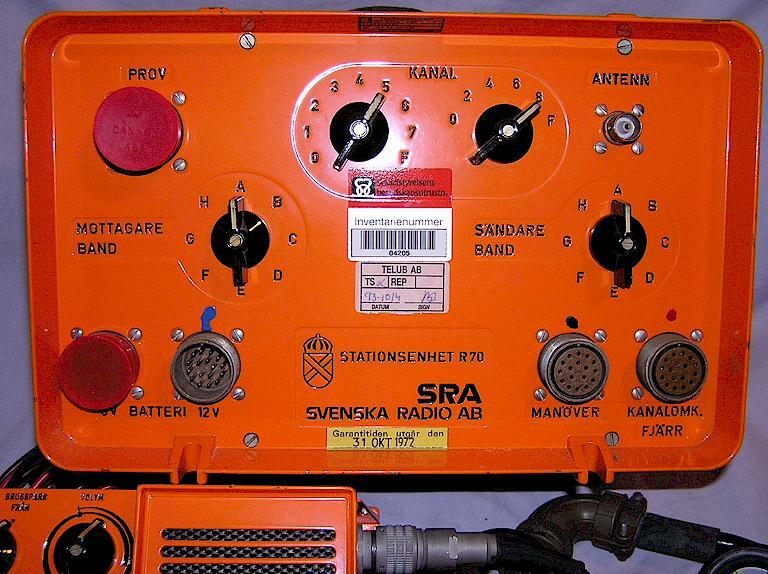 This is not a mystery radio, it is known to be a Swedish civil defense FM transceiver which operates in the 68-80 MHz range with 320 channels. The 75 MHz aircraft marker beacon frequencies are skipped. The transmitter output is a nominal 10 watts and the receiver has a rather dismal 0.6 microvolt sensitivity for 12db SINAD. They were generally stored in civil defense caches at local fire departments. It is synthesized, and originally was supplied with a large portable antenna stored in an o.d. canvas bag about the size of a golf bag. SRA was a large communications equipment manufacturer in Sweden which no longer exists, having been absorbed by Ericsson some time in the late 1980's or early 1990's. A moderate quantity of these and their antennas were imported by someone in the late 1990's, and at least one surplus dealer, Sportsman's Guide Co., was offering the radios and the antennas as separate items. It is presumed that the majority of the antennas were bought by radio amateurs for the parts value, since 68-80 MHz is not an amateur or a vehicular land mobile allocation in the USA. This example is not from that source but it is presumed to be identical to the others. This unit appears to date from the late 1960's and contains a transistorized power supply, which can be heard whining during operation. I have been unable to remove the gasketed outer cover without injury to the case, however it is presumed that the radio is partially transistorized. The rather peculiar method of channel selection was somewhat of a mystery but we now have the channel translation pdf linked below courtesy of Gert, SM7GYT. The handset is a nice, rubberized folding item similar to the NATO H-189 handsets. 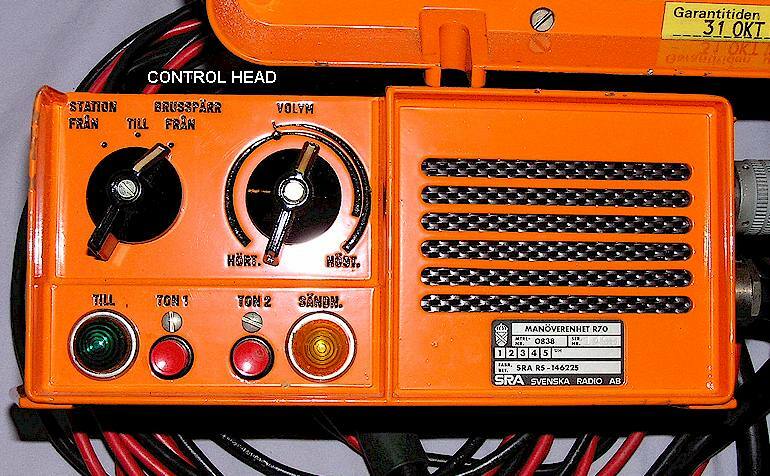 The control head is reminiscent of the RCA 700 Series radios of the 1970's. There was also a separate AC power supply, but I don't have it and they seem rare. The antenna connector is, oddly enough, a "C" connector, not exactly common in the USA. 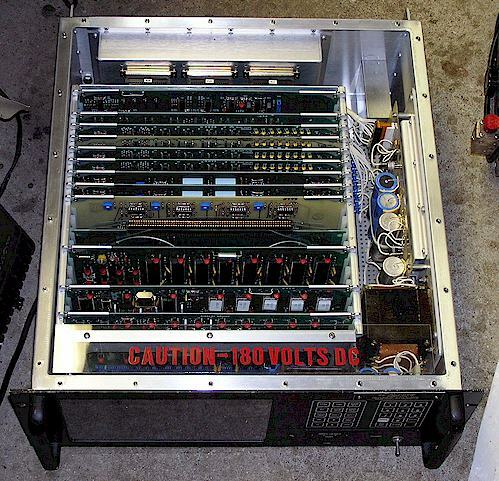 The internal circuitry is the same as was used in a larger, rack mounted SRA piece of equipment.